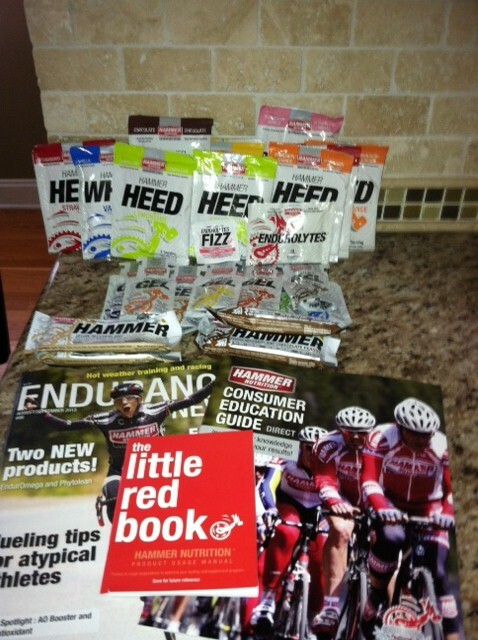 Pamommy Loves to Run: Hammer Nutrition goodies!! So most of you know I've been battling stomach problems and trying to train for a half marathon. I've been eating the Gu's and just suffering the rest of the day with GI distress (you all know what I mean). Well I decided, I really don't want to feel crappy after my long runs, my legs understandable, my stomach.... unacceptable. 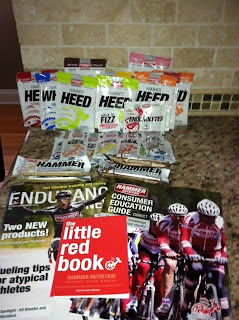 So I took some advice from an Ultra Marathoner and am going to try out Hammer products. They advertise that it WILL NOT cause GI distress. So I decided I wanted to call and talk to someone. I got a hold of them at 1100EST as they are on Mountain time and chatted with a very wonderful woman. She explained the products to me and I went with the ones that were recommended by another runner. I wanted to try out the small sizes before I purchased in bulk so I ordered 8 gels, 2 vegan recovery bars and 4 HEEDs. This is what showed up on my door. I opened the very larage box and was completely amazaed at all the extras they had sent me to try. I am in love with the "Little Red Book". I have my long run scheduled for Thursday and am going to try the gels. The HEED is for my REALLY long runs (2+ hours) and the gels are for my short runs (1-2 hour runs). I am excited to try them and will definitely let everyone know. So far I am VERY impressed with this company, and NO I was not given any product to review for free. On another note, I took my babies (twin 3 year old sons) to preschool for their first day of school I thought it would be harder than it was but my runner buddy (her son is in their class) was there and we went for a quick 5 and then got smoothies and chatted the rest of the time. I did much better this go round than I did with my daughter in kindergarten!! Anyone tried Hammer? I'm always trying to get my hydration and nutrition right, any recommendations? Can't wait to see how you like it all! I will definitely check them out upon hearing your review. Awe, the kids are growing up!!!! 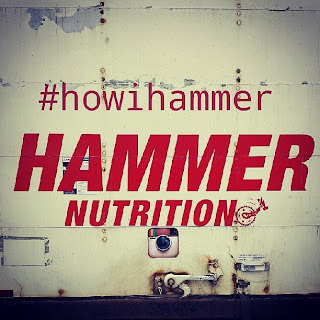 Enjoy the Hammer products. I'd like to know how you like them! I've heard good things about Hammer but have yet to try it. Very interested in what you think since my tummy likes to throw me for a loop every once in awhile. Way to get through the first day of school! I'm lucky that my kids daycare is also their preschool. Seamless transition! I'll be interested to see how you like it! I've tried Huma Gel, and FrogFuel and both of those were fine with my tummy. But pretty much everything else I have tried doesn't sit well. If this works for you, I might consider giving it a try sometime:) Good luck!